You'll be £12.00 closer to your next £10.00 credit when you purchase Shipcraft 22: German Battlecruisers. What's this? The 'ShipCraft' series provides in-depth information about building and modifying model kits of famous warship types. Lavishly illustrated, each book takes the modeller through a brief history of the subject class, highlighting differences between sisterships and changes in their appearance over their careers. This includes paint schemes and camouflage, featuring colour profiles and highly-detailed line drawings and scale plans. The modelling section reviews the strengths and weaknesses of available kits, lists commercial accessory sets for super-detailing of the ships, and provides hints on modifying and improving the basic kit. This is followed by an extensive photographic survey of selected high-quality models in a variety of scales, and the book concludes with a section on research references - books, monographs, large-scale plans and relevant websites. This volume is devoted to the famous ships of Admiral Hipper's First Scouting Group. Slower but more robust than their British equivalents, German battlecruisers enjoyed a reputation for absorbing punishment, and although Lutzow was sunk at Jutland, Seydlitz and the rest of the Scouting Group survived heavy damage. This book concentrates on the seven completed ships but coverage extends to the 'proto-battlecruiser' Blucher and the ships building or designed by the end of the war. This volume will certainly be of interest to anyone wishing to model any of these fine ships. The ‘ShipCraft’ series provides in-depth information about building and modifying model kits of famous warship types. Each book, which is lavishly illustrated, takes the modeller through a brief history of the subject type or class, showing differences between ships and how their appearance changed during their service careers The modelling section provides a critical review of the strengths and weaknesses of available kits, the accessory sets for available for super detailing of the ships and how to improve the basic kit. This nicely-produced volume is devoted to the ships of Admiral Hipper’s First Scouting Group which were slower but apparently more robust than their British contemporaries. The German battlecruisers enjoyed a reputation for absorbing punishment, and although LÜTZOW was sunk at Jutland and SEYDLITZ bottomed in shallow water, the rest of his squadron survived heavy damage. This book concentrates on the seven completed ships as well as the armoured cruiser BLÜCHER but coverage extends to ships under construction or designed by the end of the war. The book, which is lavishly illustrated and provides a good overview of these fine ships both from the actual service and modelling perspectives, is completed by a short bibliography including websites. Good value for money. Of particular interest to modelers will be the chapters “Model Products,” including in-box reviews of kits, photo-etch, and accessories, and “Modelmakers Showcase,” with its color photos of completed builds. Chapters on careers and “appearance” (including camouflage) provide valuable visual and chronological mileposts. An invaluable reference for this type of warship. Shipcraft's latest release covers all battlecruisers that operated with the Imperial German Navy prior to and during World War One. An overview of the various designs (of the eight built, half were single-ship classes) provides a fascinating insight into how British and German engineers approached firepower and protection, with the latter favoured on the continent. content that will appeal strongly to model makers. Large clear images of warships, many in full colour, display the subjects of the book and associated model kits. High quality model presentation, Strongly recommended. In my view, the strength of the publication lies in the successful structuring of its content through a number of separate categories that complement each other. A pleasant, interesting and useful publication for a diverse audience, from naval modellers, to historians and wargames players, etc. This soft-cover book is another excellent modellers reference, this time covering the series of WW1 German Battlecruisers that all saw service in WW1, and with one of them surviving in Turkish Navy service until 1971, when the Yavuz (ex Goeben) was finally scrapped. It covers the history of 8 ships, all built in response to new ships being built for the Royal navy, to be cruises, but with heavier armament and well armoured. The book starts off with the background of their design and building, including a number of useful data tables, along with archive photos, which are used throughout the book. Then it details the careers of each of the ships, with the odd one out being the Goeben, which was sent to the Mediterranean, where she ended up being taken into the Turkish Navy at the end of the war, and she survived longer than any other battlecruiser in the world. For the others, part of the High Seas Fleet, they took part in actions at Dogger Bank, and of course at Jutland. What they did prove, despite being on the losing side, was that they could take terrific punishment in battle yet still survive. This part of the book fills the first 16 pages. Then we get to the part that will interest the naval modellers among us, and I have to admit I had quite a surprise. Bearing in mind we are talking about just 8 ships, there are then 9 pages giving details of all the kits available for these ships, and it is a surprise when you see how many there are. The scales vary from 1/1250, up through 1/700 and 1/350 to even as large as 1/250. Tacked on to the end of that are two more pages listing available accessories for those kits, including turned brass gun barrels, wooden decking and etch detailing sets. This section is in turn followed by 17 pages of a Modeller's Showcase, and the model shown here, in a variety of scales, are really excellent. Two of the most unusual settings are the Hindenburg, showing what remained above water after she was scuttled and another, the upturned hull of the Seydlitz. This takes us all the way up to page 46. For any WW1 Naval modeller this has bags of information to interest you and the models illustrated in the showcase section are inspirational I thought. This book provides a useful companion to the modeller when engaging in a build of one of these vessels, however the images of Jim Baumann’s scuttled Hindenburg model in 1/700 scale is worth getting the book itself! The authors are Robert Brown and Steve Backer with George Richardson drawing the plans and the colour artwork. 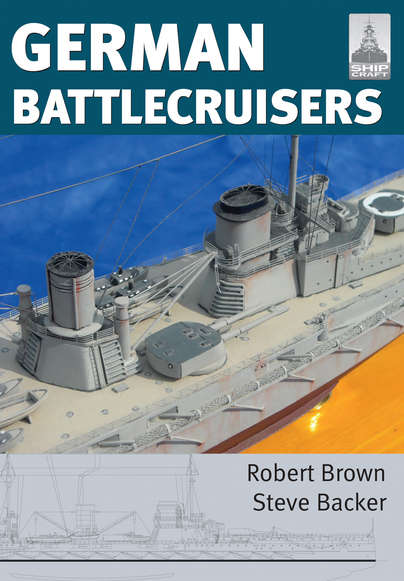 Robert Brown and Steve Backer have put together a fantastic little visual reference guide with Ship Craft’s 22 Edition: German Battlecruisers. The history sections of the book are not complex in technical data but make for interesting and informative reading. The review section, albeit brief except assessments of the kits, certainly lays out the full array of kits offered for these types of ships sold today. By and large, the individual modeler’s contributions to this publication is worth the price of admission. All of the models are fantastic representations of these battlecruisers and each modeler is extremely talented in their own right. German Battlecruisers is a well presented reference guide to its self-titled subject matter and would make a superb addition to anyone’s personal reference library…especially fans of these period German Battlecruisers from the First World War.